Jack Herer Marijuana Seeds â€” Strain Reviews â€” Dam Seed Co. Growing: Â Easy/Medium Jack Herer was produced after crossing Red Skunk and Haze strains. It has won many awards in different categories because of its outstanding sativa qualities. It is best for indoor and outdoor growing. A greenhouse set up may be good too if the grower decides to cultivate Jack Herer in a natural environment less the stress caused by strong wind, heavy rainfalls, frost and extreme changes in temperature. Female Jack Herer weed plants may acquire some male traits when under stress like too much application of fertilizers or pesticides, inadequate lighting and factors like humidity and temperature. The flowering time of Jack Herer is 8 weeks and plants can grow in medium height. In outdoor growing, harvest of buds is on the end of October. Smoking Jack Herer buds will let a pot smoker experience an intense and long-lasting high. This is a recommended strain for those who are new to growing marijuana because of less demand during cultivation. 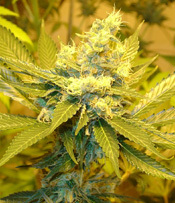 One Review to Jack Herer Marijuana Seeds â€” Strain Reviews â€” Dam Seed Co.